i20 WRC September tarmac test. October 1, 2013 – After a busy summer of intensive testing, the development of the Hyundai i20 WRC continued in the second half of September as the Hyundai Motorsport team returned the car to tarmac on a three day test session in France followed by a week of testing on gravel at high-altitude in the South of Spain. ‘For the last couple of months we’ve tested every two weeks on all kinds of conditions and surfaces to continue the collection of valuable feedback and data. After the Finland test it was very important for us to take a short break back at the factory in order to review and evaluate the work done so far as the schedule will be even busier from now on’ observed Hyundai Motorsport Team Principal Michel Nandan. i20 WRC September gravel test. The Hyundai Motorsport team travelled from Germany to France in mid-September then to the South of Spain last week to test the car at altitude with both Bryan Bouffier and Juho Hänninen behind-the-wheel of a brand new i20 WRC. ‘This car is the same specification of the one we used in Finland in August but it features a couple of new elements. Also we have tested at altitude conditions’ said Nandan. ‘Altitude is one of the challenges we’ll have to overcome next year in the FIA World Rally Championship especially in Mexico where the stages go up to 2500 meters. The performance of the car can be affected under these conditions so the aim on this test was to study the engine behaviour and monitor the impact on the engine power. We also took the opportunity to keep on working on gravel set-up solutions and do some good mileage with the car’ explained Nandan. 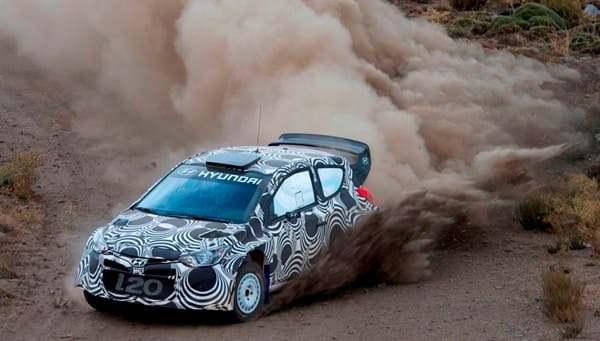 Hyundai Motorsport’s test programme will continue unabated over the next months as the challenge in next year’s WRC begins in just over 100 days.